Lake Audubon is one of Reston's most beautiful spots, and the neighborhoods that border the lake are in high demand. When a home in one of these communities comes on the market, you have to act fast! Cedar Cover Cluster near South Lakes is one community to keep an eye on. 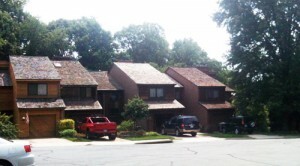 About 20% of the 66 townhomes are direct lakefront property, and all have lake access. These lovely cedar-sided, 3-story homes have 3 or 4 bedrooms and garages. 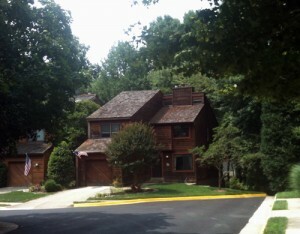 The Cluster was built between 1980 and 1989 and is located on Cedar Cove Point off South Lakes Drive in South Reston. This family-friendly neighborhood boasts a large playground for the children and is close to schools. Walking through Cedar Cove Cluster on a beautiful day with a gentle breeze rustling the many trees, you feel a bit like you're at a resort. Yet, you are just minutes from the Reston technology corridor, the Reston Metro station, and the Dulles Toll Road. South Lakes Village Center (home to a few of Reston's favorite mom and pop restaurants) is just ¾ mile up the road. This neighborhood is the ideal in lakeside living. If you see one of these homes come on the market, jump on it!